MUMM-RA summons HAMMERHAND and his BERSERKERS to his pyramid and coerces them into his bubbling cauldron. When they emerge, they are coated in Thundranium and set out to capture the ThunderCats. PUMYRA, freeing a trapped Unicorn, finds herself in a BERSERKER trap. Weakened by being in close proximity to the BERSERKERS’ Thundranium armor, she is set free to lure the other ThunderCats. As BEN-GALI and LYNX-O locate PUMYRA, they find themselves in a BERSERKER trap and are attacked. Fleeing to the nearby ThunderStrike, the pursuing BERSERKERS attack the ship. LYNX-O uses his light shield to signal the Cats’ Lair. LION-O and the other ThunderCats rush to him leaving SNARF and the THUNDERKITTENS at the Lair. 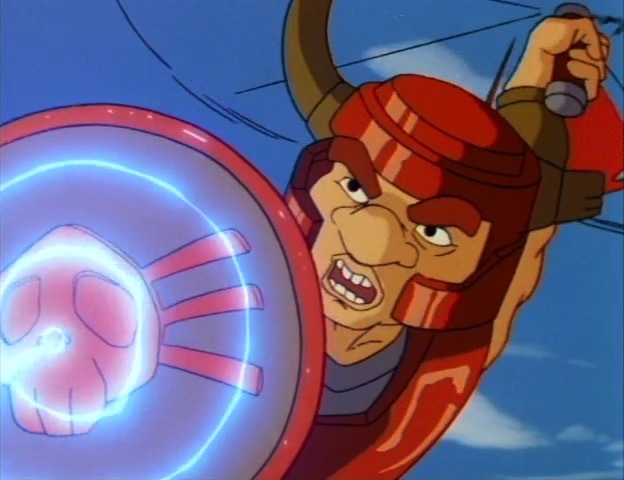 As the ThunderCats battle with the BERSERKERS, the Thundranium armor wears off and the BERSERKERS retreat cowardly. 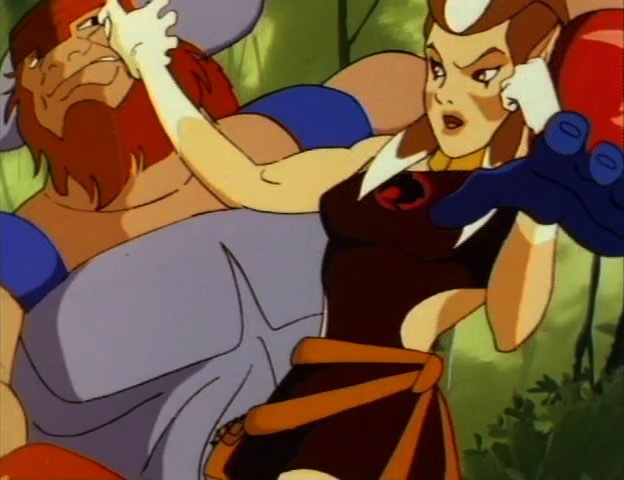 Returning to Cats’ Lair, the ThunderCats discover that ALURO seemingly hypnotizes LION-O and TYGRA, but they have cleverly used ear-plugs to block out the sound of ALURO’S voice. 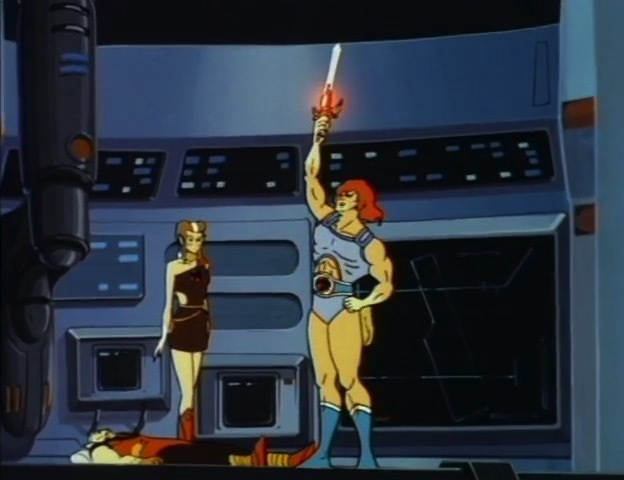 Using the Sword, LION-O and the ThunderCats defeat the evil LUNA-TAKS. Both Cheetara’s and Lynx-O’s heightened powers of intuition sense some evil is threatening nearby. Mumm-Ra has called up the Berserkers and coated them in his cauldron with thundranium, the ThunderCats’ metallic nemesis, which weakens their power. In his efforts to resist the ThunderCats’ code of Justice, Truth, Honor and Loyalty he bids they capture the Tower of Omens. When Lion-O and the others leave Cats’ Lair to help, Mumm-Ra informs the Luna-Taks, who set out to capture the Lair. In facing the Berserkers, Lion-O cleverly creates a dust storm to rub off the Thundranium from them. Realizing their magic aid is gone, the Berserkers flee. 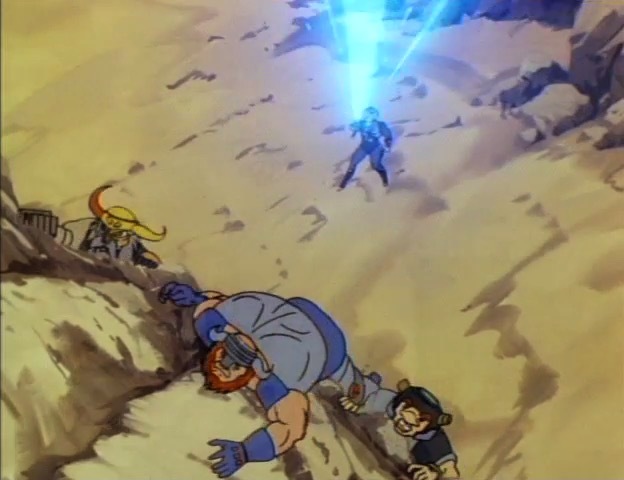 Lion-O uses the healing powers of the the Sword of Omens to help Lynx-O recover from his wounds. 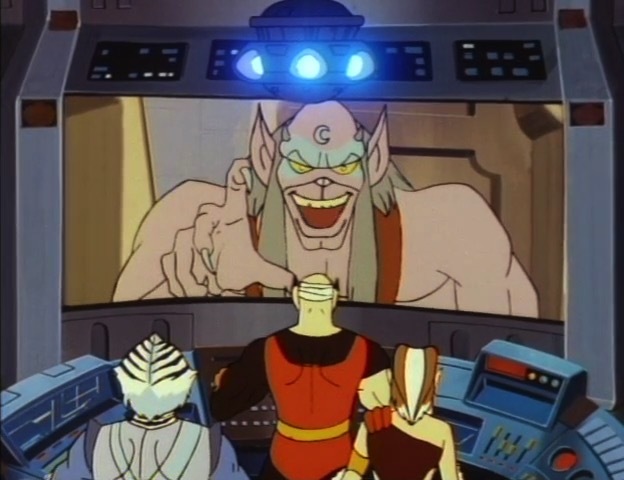 When the Thundercats turn their attention to the Lair, they discover it captured by the Luna-Taks and under the spell of Aluro’s psychic powers. But Lion-O and Tygra cleverly plug their ears with cotton, resisting Aluro’s spell, and rout the Luna-Taks. When the Tower of Omens was built in “Mumm-Ra Lives!”, its purpose was to serve as a tactical outpost—an early warning system against the new threat posed by the Lunataks. As Lion-O said at the time, “The Lunataks can move anywhere, terrorize and plunder wherever they want to.” Time and again, though, throughout Seasons Two and Three, the Tower falls first and easily. Staffed only by three ThunderCats and lacking any firepower of its own, it’s 20% observation deck, 80% hangar, and 100% easy target. Here in “Together We Stand”, we see Mumm-Ra and his minions exploit these weaknesses expertly and demonstrate a level of thoughtful, coordinated strategy on par with their successes in “Pumm-Ra” and “Snarf Takes Up the Challenge”. And it almost works. Few episodes begin with such an air of dread. 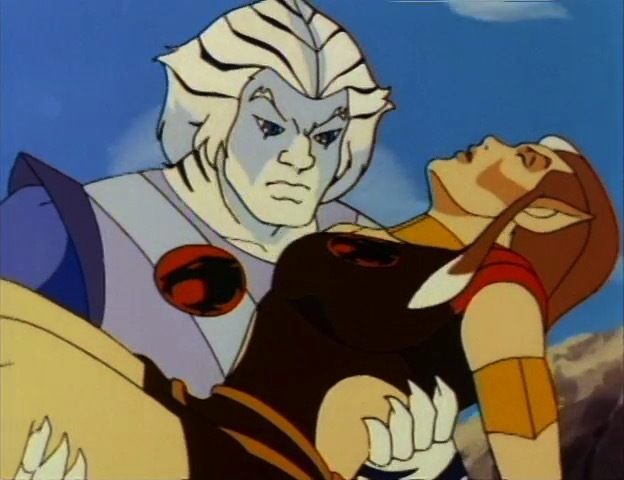 Independently, Cheetara suffers a debilitating psychic attack that she likens to “a bomb going off in [her] head,” before collapsing entirely; and Lynx-O can’t shake uneasy feelings of some waking evil. Yet none of the tools at the ThunderCats’ disposal—Sight Beyond Sight, the Lair’s long-range scanners, the Braille Board—can confirm these bad vibes. The implication, suggested through crossfades and crackly lightning, is that Mumm-Ra is hatching a plot so diabolical that it’s casting some sort of palpable, paranormal penumbra over Third Earth. “Oh, ageless forces of darkness! Once, Third Earth was ours to pillage and despoil!” As usual, Mumm-Ra’s soliloquy game is on point. We join him at the Pyramid, where the Ancient Spirits of Evil answer his plea with an urnful of thundranium—the first step in his strategy. Mumm-Ra’s scheme is smart and simple: attack the Tower first, since it’s the weaker stronghold, drawing the Cats away from the Lair and in turn making the Lair more vulnerable. 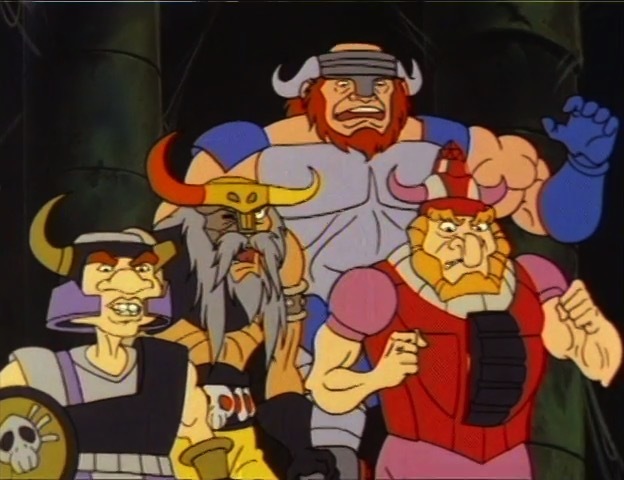 The Berserkers return in this, their final appearance, to take on the new ThunderCats at the Tower; and once their half of the plan has succeeded, Mumm-Ra enlists Luna to take control of the Lair. In short, the plan works, but it’s the action at the Tower that stands out—and not just because it consumes the majority of the screentime. But BenGali steals the show. His earnest concern for Pumyra, and the furor he expresses while fending off the Berserkers and carrying her to safety, feels urgent and real—it’s easily among the series’ tensest moments. It also features a stunning new music cue to accompany his appeal to the Hammer of Thundera. And in the end, after the Berserkers have consigned defeat and begun to withdraw, he opens fire on them from behind. It’s momentary—two seconds of unnecessary pursuit—but it speaks volumes to the rage he must feel over what the Berserkers have put him and his friends through, both here and in “ThunderCats Ho!”. It’s not very ThunderCat-like, but it is exceedingly human. Except for two shots, the entire episode maintains a constant screen direction, with the safety of the Tower on the right and the threat of the Berserkers on the left. It’s a keen stroke of art direction, and it draws attention to the closeness of the action to the Tower—the enemy is in the front yard, but home is just out of reach. This spatial relationship of danger to the left and safety to the right is reinforced when (ahem) reinforcements arrive—Lion-O and Tygra fly in from screen-right—and it makes us fear for Bengali and Pumyra when they escape in a ThunderStrike pod and head left, away from the Tower rather than toward it. Even a sequence this well-executed has a few head-scratchers, though. 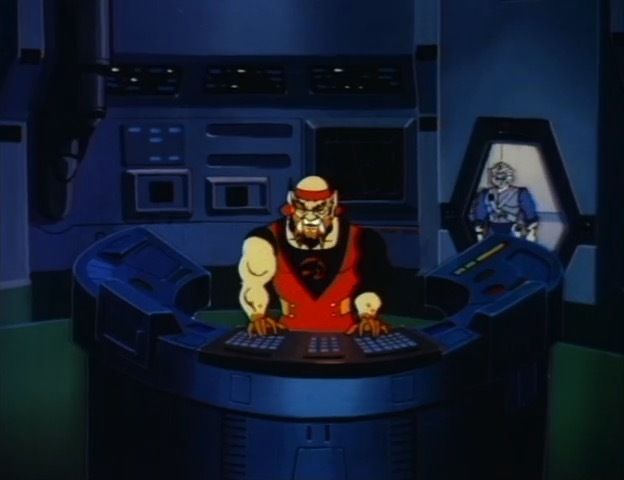 It’s unclear why the Berserkers direct their attack on the ThunderStrike’s empty pod, when the central cockpit is clearly where the ThunderCats are holed up. When BenGali and Pumyra move to the other pod, the Berserkers don’t seem to notice; and they seem surprised that “there be but two of them in the dinghy” upon pursuit, despite Top-Spinner encountering Lynx-O in the central cockpit (after he drills into it through the floor like a badass). All of this seems to imply a disconnect between the ThunderStrike’s design as we know it, Englehardt’s understanding of that design, and the execution of the scene in animation. Yet there are some standout moments of animation in “Together We Stand”. Early on, with the Screen of Omens lowered but nothing projected onscreen, the Tower control room is eerily dark, a perfect reflection of the scene’s foreboding feel. 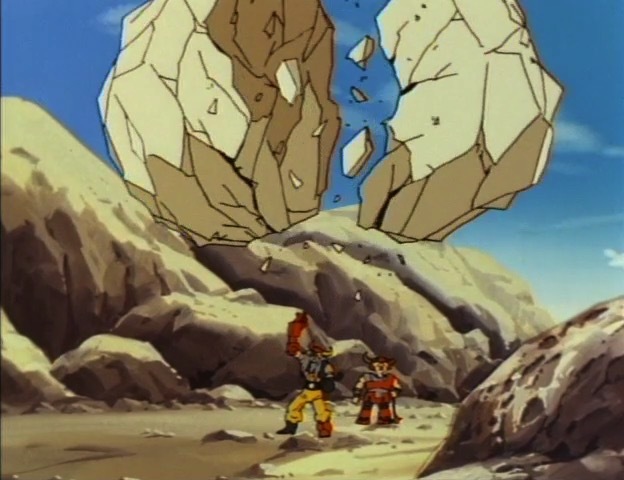 And later, in a striking time-dilated sequence of three shots, the power of Hammerhand’s thundranium-plated hammer is illustrated splitting a falling boulder in two. The final shot before the coda is also excellent: a beautiful vertical pan of Cats’ Lair—possibly the series’ best and most detailed background of the fortress—that drives home the Lair’s superiority as a stronghold. Despite an excellent plan that went very well, it doesn’t quite work out for Mumm-Ra in the end. He probably should have traveled to the Lair himself to cement the victory. Either way, with its denizens distracted at the defenseless Tower, the Lair falls easily, exposing a serious weakness in the ThunderCats’ tactics as defenders of Third Earth: a weakness that they never seek to remedy and which will be exploited again (in “Soundstones”) and again (in “Day of the Eclipse”) and again and again and again. Together we stand, divided we fall; the Tower of Omens is a beautiful mistake. 1 ^ Only through Lynx-O’s ingenuity in “Mumm-Ra Lives! Part III” is the Cats’ Eye weaponized for fending off SkyTomb—something it wasn’t designed for and is never used for again. 2 ^ After this scene in the control room, we don’t see Cheetara again for the rest of the episode. Perhaps she just sleeps through the Lunatak takeover. Speaking of which, where’s Panthro? 3 ^ In fan attempts to place Season Two episodes in a continuity order, it’s been suggested that the evil sensed by Cheetara and Lynx-O is unrelated to the events of “Together We Stand”, but instead foreshadows a more cosmic or primal evil, like the lunar alignment that activates the Egora Talisman, or Ma-Mutt’s discovery of the Norvog Noszh. 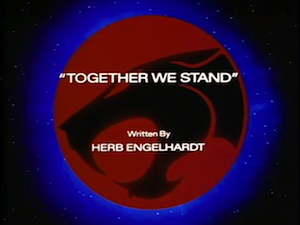 4 ^ Toy-motivated or not, Leonard Starr’s reinvention of Hammerhand and his crew in “ThunderCats Ho!” could have made them a mainstay of later seasons, and their characterization (and inspired vocabulary) shines on here under Herb Englehardt. 5 ^ This is the episode that establishes Pumyra as a healer, but it’s a skillset she never makes use of again. 6 ^ The high angle on Bengali’s smoke cloud from behind Top-Spinner and Ram-Bam puts the Tower to the left instead of the right, as does the shot immediately after it. Ram-Bam at first declines Mumm-Ra’s offer of a dip in the Thundranium-infused cauldron, citing a bath he took “two months ago.” This might be an indication that two months have passed since their ship sank in “ThunderCats Ho! Part Five”. Lynx-O’s hearing can pick up Pumyra’s “life force” at a distance, a sixth sense demonstrated again with the Stone Giants in “Return to Thundera! Part I”. Lion-O operates the HoverCat for the first time in this episode, and it would become his signature vehicle for the rest of the season (“Soundstones”, “Runaways”, “Vultureman’s Revenge”). Aside from Tygra in “ThunderCats Ho!” and “Return to Thundera! Part IV”, no one else ever pilots it. The Berserkers knock out the ThunderStrike pod’s port engine twice—a surprising flub in an episode so replete with expert animation continuity. When Jaga advises that Lion-O use the Eye of Thundera to heal Lynx-O, Pumyra is looking right at him. The Lunataks demonstrate pride in their “beautiful moon” insignia in a way that the ThunderCats never express for their own cat symbol. As a kid, this was the first episode I ever recorded on VHS. I’ve seen it more times than I care to think about.